This is best introduced as a class activity. Students collect points for each toss of the die unless a ONE is tossed, which means they lose all of the points they have collected in the round. 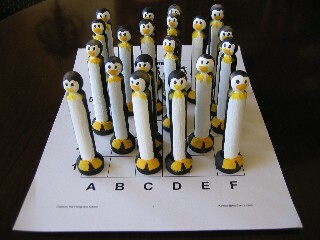 To prevent losing their points, students may elect to stop at any point in the game before a ONE is tossed and they get to keep the points they collected but get no further points. Students love the game and begin to appreciate that theoretical probability and experimental probability are often quite different! Once students are familiar with the game, encourage small groups to develop a "winning strategy" and explain it to their classmates. Then play the class game with groups competing to see who has the best strategy in the actual game. Repeat, as necessary, for students to modify strategies. Make copies of the Pig printout with lines or the Pig printout without lines. Younger students should write about what they learned from playing the Game of Pig. Older students should describe their "winning strategy" and explain the mathematical reasoning behind it. 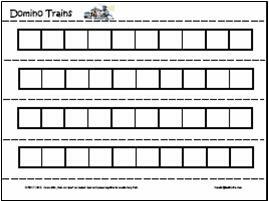 After reading 100 Days of Cool by Stuart Murphy, consider using Murphy's Domino train idea to celebrate the 100th day of school. Students must make a domino train by placing dominoes end-to-end. The train must have exactly 100 pips or dots. See more 100th Day Math-Literature Connections and related activities. The wolf pursues a chicken for his chicken stew, but he decides to fatten up the chicken first. He delivers 100 pancakes one night, 100 doughnuts the next, and a 100-pound cake the next night. But, when the wolf finally goes to claim his fattened chicken, he's in for a surprise. See 100 Things We Wish the Wolf Had Brought for cover and student sample page so that students can write their own class version of this book celebrating 100 things. See more 100th Day Math-Literature Connections for this book and other 100th Day of School books. Hundred Board Logic 2 Problems: What's My Number? is a collection of simpler logic problems for Grades 1-2 that challenge students to use clues to eliminate numbers from the hundred board until a single number is left as the answer. See Hundred Board Logic Problems for directions and to download the problems. Challenge students to write their own Hundred Board Logic problems and challenge classmates to solve them. Name Patterns: This activity uses a blank hundred grid to form name patterns. Students write one letter of their name in each box and continue the process until they fill all 100 boxes. They then color in the first letter of their name and examine the pattern formed. Class discussion following this activity centers on sorting the name patterns into similar piles of color patterns. Students might also be encouraged to see whose names are completed on the 100th letter and whose names are incomplete. What patterns can they find in this sorting? Colored Hearts: Can You Finish the Pattern? challenges students to identify the pattern and extend it by coloring in the white hearts. Teachers should require students to classify the patterns (AB, AAB, etc.) and explain the pattern they see and how they decided to continue the pattern. Grab the Candy Game: Valentine's Day Version practices coordinate graphing skills. Students use candy hearts or foam heart cutouts to mark the ordered pairs formed from tossing two dice. Two versions are included to meet the varied needs of learners. Use the same rules as the original Grab the Candy game or modify the game to a simple 4 hearts in a row to win the game. Whichever version you choose, students enjoy the practice. See more Valentine's Day Activities. After reading One Hundred Shoes, by Charles Ghigna, lead students to complete the 100 shoes activity. This centipede activity has both number sense and patterning components so students have a rich mathematical tie-in to the book. Let students play this game to celebrate the 100th day of school. Give each child a copy of the game mat and a regular 6-sided die. Students take turns tossing the die and adding that many tally marks to their game mat. Dots and dotted lines prompt students to organize the bundles of 4 tallies and "close the gate" by drawing the fifth tally across the other four. The first student who completes the 100 tally marks wins the game. 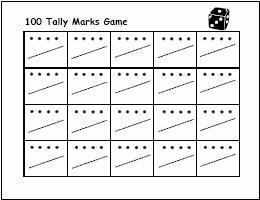 Download 100 Tally Marks Game Mat. This discrete math activity challenges students to find all the different paths that spell HEART if they can only move from a letter to one of the two letters directly below it. These webpages are resources for the 100th Day of School celebrations. See 100th Day of School Activities for 100 Board activities, problem solving, Bundle Song, and links to 100th Day Activities on the web. See Math-Literature Connections: 100th Day of School for suggested books to celebrate 100. NOTE: Activities are currently being developed for many of the books listed on this page so check back during the month.